Hi Shannons - love your site! I think you will find that a lot of the recipes in Betty Crocker are bland, as that was the 1970's preferred taste (or whenever this book was originally printed). Hi! I just want to say that this was really wonderful. I substituted a serrano chili pepper for the jalepenos and used Mock Dock (seitan) instead of the Morning star chick'n strips. We also served it over millet, which has lately become my fave grain. The dish was so easy to put together. Thank you, dear Shannons, for adding to our household menu. I can't wait to try out future recipes. 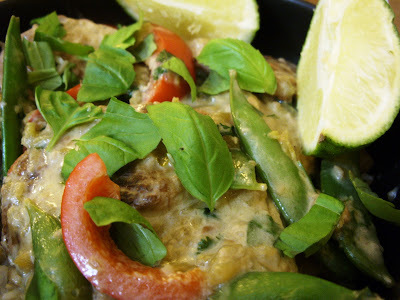 I was looking for a Thai coconut chicken recipe and came to your blog first- so glad I did! I made this for dinner last night and I can't stop thinking about it ALL DAY today! It was amazingly fabulous! Thanks for publishing such a great recipe to your site!!! This is so delicious! I've made a few thai-style recipes, but none came close to authentic tasting. This one blew my mind. It was so easy that I was not prepared for how good it was! Next time I'll use half the can of jalapenos, though. I loooove hot, but I was picking around the peppers to get the delicious sauce. Served it over quinoa & kale. Thank you!